Healthy Green Kitchen Healthy Green Kitchen - Page 18 of 246 - Simple Food. Balanced Living. Violets pop up all over my yard every year at this time, and I’m always extremely excited when they do. Violets are edible, and though picking them can be a little painstaking, I really enjoy eating and making things with the delicate purple beauties. 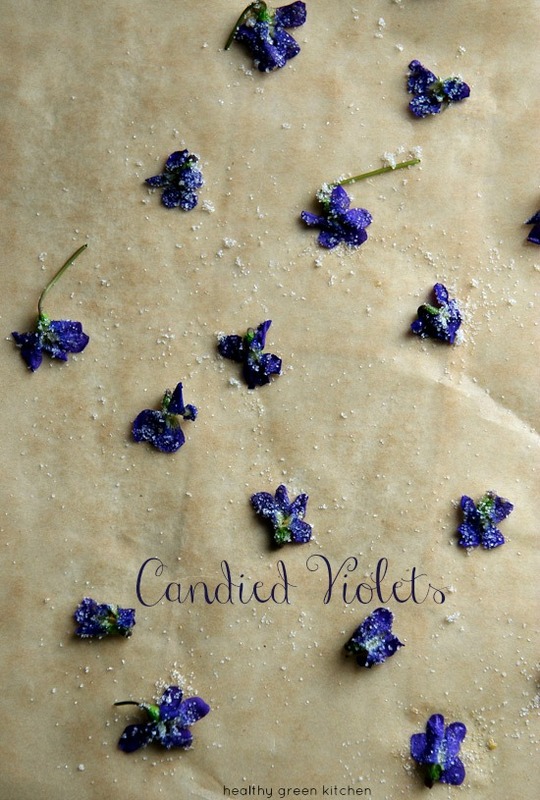 Yesterday, I made candied violets. As I mentioned above, violets are delicate…fragile. If your lawn is similarly dotted, and you’d like to use them in a recipe, plan to do so right after you pick them (otherwise they will wilt). I decided to make just a small amount of sugared violets (I will tell you why tomorrow) so I didn’t pick that many flowers. 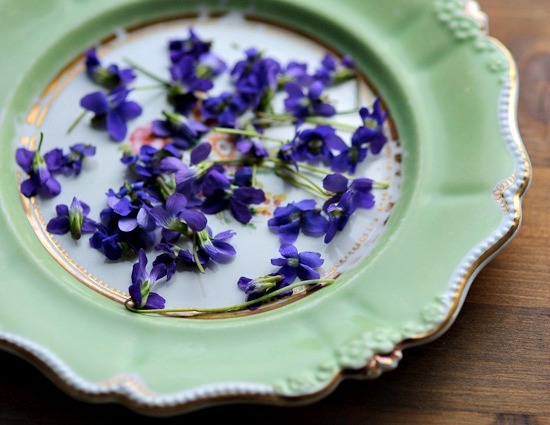 If you want to make lots of candied flowers, or a syrup or jelly with your violets, you’ll need to pick quite a lot. To make candied/sugared violets, all you need is the flowers, some sugar (I used organic sugar), and something to get the sugar to adhere to the flowers. Generally I would use beaten egg white, but since I wanted these candied violets to be vegan, I used a slurry of flax seeds and water*: approximately 1 tablespoon ground flax mixed with 3 tablespoons water. The mixture was somewhat thick so I did add a little more water as I was working. Superfine sugar is the best type of sugar to use for candied flowers: you can whir regular (or organic) sugar in a food processor to make it more fine, if you like. As I’ve mentioned in each of my #SAVEITSUNDAY posts, we Americans waste a lot of our food: this food waste has devastating consequences to our environment and our wallets. In past posts I have mainly focused on ways to store your food at home so you can waste less (Glad’s Protection Pointers have been very helpful to me), but today I want to do something a little different. 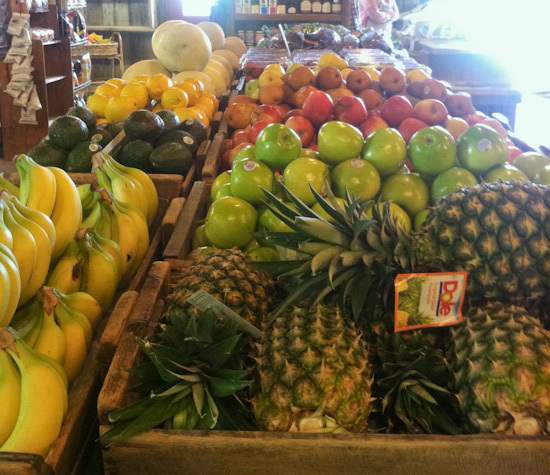 I want to talk about 5 ways you can reduce food waste before you even bring your food home. I recently taught a class on making lacto-fermented vegetables. 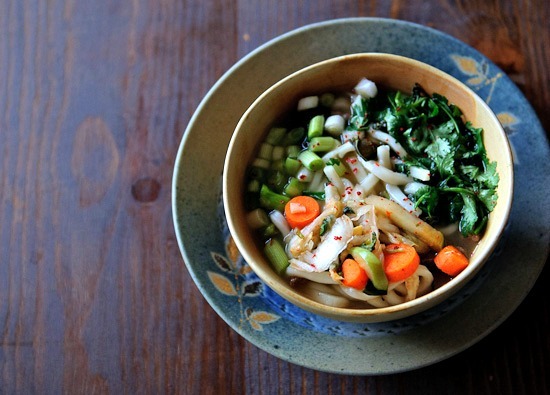 We talked about sauerkraut, pickles, and kimchi, and I demo’ed how to make kimchi. I used a recipe just a wee bit different from this one…I’ve been making it over and over and I love it. 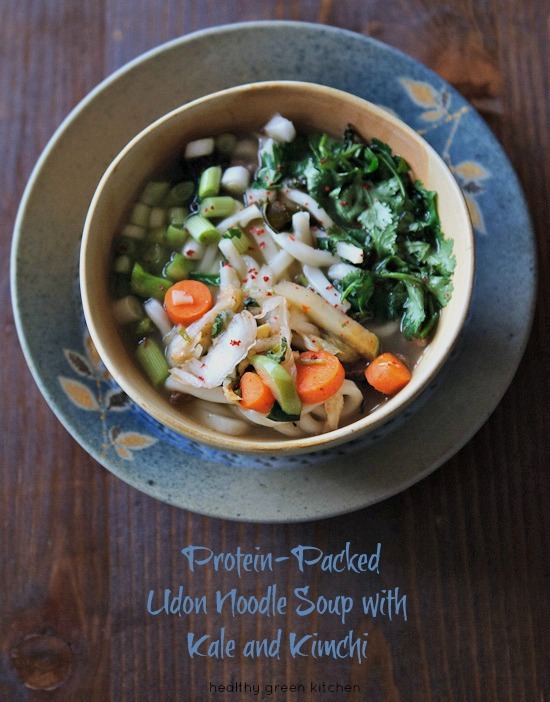 One of the ways I like to eat it is mixed into this Asian-inspired Udon noodle soup.